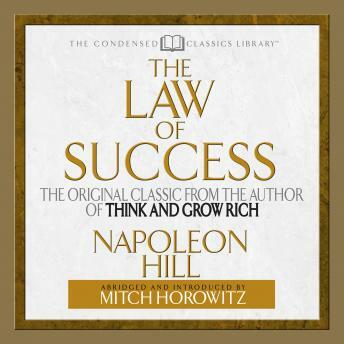 In The Law of Success, the legendary motivational master Napoleon Hill (Think and Grow Rich) makes his fullest, most in-depth exploration of the fifteen principles that lead you to prosperity, purpose, and mastery. -The incredible power of a Definite Chief Aim. -How to transform your subconscious into a receiving station for insights, intuitions, and breakthrough ideas. -Why the Golden Rule is your secret path to power and prosperity. -How to profit from failure. -How your sincere enthusiasm influences clients, customers, and backers.Abridged and introduced by PEN Award-winning historian Mitch Horowitz, this compact edition of The Law of Success is more than just a blueprint to success. It is your guide to a new life of effectiveness, purpose, and progress.